University of Adelaide student Emma Shattock has won the inaugural Ron Pollard Undergraduate Scholarship Award. The award was established in memory of the late Ron Pollard, NSW producer and former president of the Pork Council of Australia. Raised on a mixed sheep and cropping property in the mid-north of South Australia, Emma developed an interest in nutrition while working with cattle for the Royal Adelaide Show during high school. She is now about to enter her third and final year of a Bachelor of Science (Agricultural Science), majoring in livestock science. Emma said the award will assist her in gaining further insights into livestock nutrition. 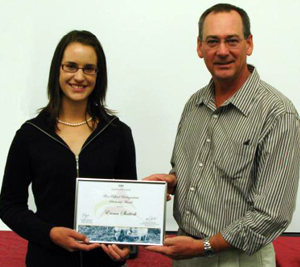 The award was presented to Emma at a ceremony held at APL headquarters in Canberra on the 13th February 2009. It was presented by members of the Pollard family – son Ean, Ron’s widow Faye and Ean’s wife Janine. More great information about these public forums (inlcuding vodcasts) can be found on the government’s Public Awareness and Engagement website, and also on the Centre of Expertise in Photonics wordpress blog. Construction has begun on the State’s first School of Veterinary Science, at the University of Adelaide’s Roseworthy Campus. The $37 million building project – funded by Commonwealth ($15m) and State ($5m) governments and the University ($17m) – will see the construction of a new 5000 square metre building that will house teaching laboratories, a clinical skills laboratory, an e-learning centre, a pathology teaching and diagnostic suite and a veterinary teaching hospital at the University’s Roseworthy Campus. The project also includes the refurbishment of existing lecture theatres, laboratories and offices.The new building is scheduled for completion in 2010. The new Vet School had its first intake of 47 students in 2008 for its three-year Pre-Veterinary undergraduate Science degree and has since received about 400 applications for places in 2009’s intake. To complete their training, graduates of this degree program will then study for a three-year postgraduate veterinary science degree. 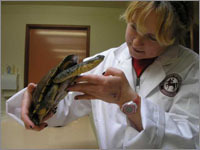 There will be 70 places a year for the postgraduate veterinary science degree starting in 2011. Head of the School of Veterinary Science Professor Gail Anderson says veterinary students at the University of Adelaide will have a broad exposure to all aspects of veterinary science, including livestock production, equine health, aquaculture and biosecurity, companion and exotic species. for more information about studying Veterinary Sciences at the University of Adelaide, please contact the Faculty of Sciences.